Dodie, aka Dodie, is a beautiful 2-year-old red fawn female, born May 1, 2005. Her sire is Flying Penske and her dam is Okie Karrie Okee. 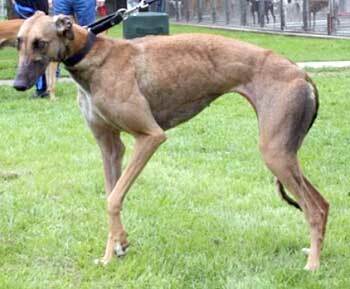 Dodie arrived with the large group of greys on Easter Sunday 2007 from the seasonal close of Valley Race Park. She did not show ANY interest in racing, so has no participation in races. Dodie is a shy little girl with a big heart for humans! Dodie's Cat Test: Miss Dodie showed interest in the cats when introduced, but after a couple of good sniffs, she was off to other things. She even got to get nose-to-nose with one of the cats in the back yard. Once again, she sniffed the cat and the cat's immediate surroundings, then continued to sniff further away and into the yard. The dog-savvy cats seemed to know pretty, petite little Dodie was not a menace to them. She gets along greyt with the hounds of the house, but mostly wants to hang out close to me...and snooze on a dog bed. Dodie is a beautiful, dark "singed" fawn with a white blaze down her throat and chest. She's ready for a loving forever home with someone who can't resist giving her loads of TLC. We began fostering Dodie simply because she tugged at our heartstrings - she was very underweight coming into the program and needed a comfortable place to rest her bony body. We set up an x-pen in the middle of our living room so she'd have a large place to lounge by herself, without the other dogs bothering her. It's become her little retreat, and, although it's no longer a necessity, she still goes in there when she wants to lounge. She has blossomed into a fantastic little girl in a few short weeks! Once a very timid, unsure dog, she is now a confident, twinkling soul! She'll "smile" when her name is called as if she realizes she's in the spotlight. There's not many places she'd rather be than right by your side, whether we're in the backyard or putting the dishes away. She loves her "humans!" Dodie is crated during the day when we're at work, but has free run of the house while we're home. She sleeps quietly on a dog bed in our bedroom at night, and has never asked to get on the furniture. She loves to sit in a lap, though, but only if we say it's OK.
One look at her cinnamon eyes and you'll melt - guaranteed! Dodie will give unconditional love to whomever is willing to bring her home.